Now out as an ebook, available in paperback soon: a memoir which explains the inspiration for Children of the River as well as revealing the true life love story that grew out of it. Readers often ask me if Sundara and Jonathan got married in the end, and while reminding them that these are fictional characters, I’ve enjoyed telling about the Sundara and Jonathan type weddings I’ve attended. Weddings aren’t the only happy endings, though! Recently I was surprised and delighted (and envious!) to see that Putsata Reang, the youngest daughter in the Reang family who inspired the story, had succeeded in publishing a column in The Modern Love section of the New York Times. Since my own offerings there have been rejected, I was impressed! She has also published articles, a true crime book, and is working on a book-length telling of her family’s coming to America. I will be the first to buy and read it! This staged picture of me with my son Miles and Putsata Reang appeared in our local paper when Children of the River was first published in 1989. In writing Children of the River, I researched the Cambodian holocaust and read about the Western journalists holed up in the American Embassy after the Communist takeover. What a thrill, then, to be shipping a box of the resulting novel to that very embassy twenty-five years later, knowing my story would be read by these young Cambodians! Thank you to Daniel Labarca, a Peace Corps volunteer who had taught the book in California and thought it might work in Cambodia as well, and good luck to these students in their study of English. Widely available in stores and online. For new hardbacks with original cover, click here to order from author. The wedding of the daughter of Koh Sam-ou, the woman to whom I dedicated the book. Below, her sister with her fiance. They were married the following year. This is the third cover the book's had in it's 29-year-print run, and I have mixed feelings about it. I like the use of an image of Angkor Wat, the ancient temple in Cambodia, and that the model actually looks ethnically Cambodian. She seems more like twelve, though, than seventeen, the age Sundara is for the story. My main gripe, however, has always been the font chosen by a designer in New York, which looks like the titling for a spooky book, a font actually called "chiller." If anybody at Random House had asked me, I'd have said this lettering seems completely disrepectful of the grace, beauty, and control of the various Asian calligraphies. I designed the cover for Wedding in Yangshuo myself, and was able to use a font more to my liking. I live with my husband on a small farm in Corvallis, Oregon. Although the acreage is now planted mainly in trees, in the past, we’ve grown vegetables, berries, and flowers, and often needed to hire extra hands to help with the picking. In 1980, a Cambodian family came to work for us during harvest. As we became friends with them and heard about their escape from Cambodia in 1975, I began to realize that every Cambodian refugee in the United States probably had an equally fascinating story. Since I hadn’t read a novel for young readers that dealt with this issue, I thought I might try to fashion the stories into one myself. I knew nothing about the history and culture of Cambodia, so I spent a year in research before I ever started writing the first rough draft of the book. I read everything I could find on the subject and interviewed Cambodian refugees as well as those who had worked with them. Their stories gave me many plot ideas and details for the book. The manuscript was written and rewritten several times over the next few years, as with each draft I tried to improve it. Of course I had hoped that the book would be immediately accepted by a publisher, but this was not the case. CHILDREN OF THE RIVER was rejected sixteen times before it was finally accepted by Delacorte Press in the spring of 1987, to be published in 1989. This shows how difficult it can be for a new writer to break into publishing! It also shows, though, how persistence is sometimes rewarded. One question I’m often asked is if the main character, Sundara Sovann, is based on a real person. She isn’t. Sundara is a fictional character put together out of many different Cambodian girls I met or heard about. This is also true of the other characters in the book. While every incident in the book is based on something I read or heard about, the actual story is fiction. You could say it’s all true, and none of it’s true. But this is one of the things I like about fiction, the way imaginary characters and incidents can sometimes convey a larger truth more powerfully than a strict recounting of facts ever could. Writing Children of the River has had a far-reaching impact on our lives. My oldest son, who was then about three, used to play with the Cambodian children whose parents worked on our farm. Sometimes, for long stretches, they were the only other children he saw, and I often tell the story of how he came to me one day and said, “Mom? When is MY hair going to turn black?” When I began working on the book, I imagined him grown up to Jonathan's age and wondered what it would be like if he fell in love with a beautiful Asian girl. I can’t help wondering if knowing these wonderful people, our Cambodian friends, is at least part of the reason he has grown up intensely interested in all things Asian. He is fluent in Mandarin and Cantonese, reading and writing Chinese characters and now makes his living translating Chinese to English on the internet for clients all over the world. He and his bride had three weddings, one in Yangshuo, China, a second at the Benton County Courthouse soon after her arrival in the United States and a third full-blown American style ceremony. We were honored to have the Reangs as special guests at our son's wedding. 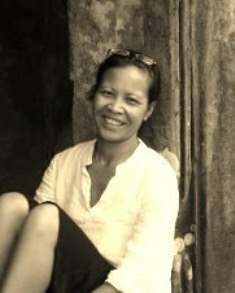 It’s been interesting following the lives of the Cambodians who inspired the story in the first place. So far the girls have all married white men. Occasionally someone will take issue with this in my book. Not to my face, but perhaps in a posting on Amazon.com or a comment in a journal. Why did I have to write about an Asian girl and a white boy? In my defense, I can say only that I’m trying to reflect reality and for whatever reason, this does seem to be a reality. Likewise, I once stumbled over a criticism that I had “perpetuated the myth of the model minority.” Again, I make no apology. Part of the reason I wanted to write about the Cambodians was because I so much admired them and the way they had worked so hard to overcome obstacles in finding new lives here in the United States. To witness their stories of educational and economic success and then write stories of failure would hardly seem fair! Tony Thy used to play with our son Miles on the farm. Now he's a successful businessman in Southern California, shown here at his wedding. Tony taking a ride on the John Deere with my husband Herb and son Miles, circa 1982. The Aspara dancing tradition was nearly destroyed by the Khmer Rouge, but has now been resurrected.